As I sat in secondary-school physics lessons, I couldnt wait for it all to be over. My interest in physics had been diluted to homeopathic levels by rote learning and mindless calculations. I was ready to give up and become a medic. My epiphany came while studying Science for Public Understanding as an extracurricular activity. As part of this we had to write a report on a popular science book; I chose Warped Passages by Lisa Randall. I was instantly hooked. It was a million miles away from what we were doing in class, and it inspired me to continue with physics and find out about other things beyond the classroom. Being a bit of a nerd, I googled sixth form science bursaries and came across the Nuffield Science Bursary Scheme, which allows students in their final two years of secondary school to undertake a four-to-six-week research project in their summer holidays. In the summer of 2008 I secured funding to work in the neutrino astrophysics group at the University of Sheffield. This meant a four-hour commute daily for my whole six-week holiday, but it ended up being worth it! My project consisted of two elements that formed background work for the Acoustic Cosmic Ray Neutrino Experiment, which aimed to detect ultra-high-energy neutrinos by listening for the sound pulses they were theorized to produce when entering seawater. The first part concentrated on background noise with an aim to filter it out. I studied data recorded by the ACoRNE detector and looked for echolocation calls, attempting to figure out what kinds of animals were making the noise. The second part involved simulating the sound pulses triggered by an incoming neutrino in a water tank and looking at how a detector responded. It was very exciting to know that I was actually contributing to research and not just fetching cups of tea for people. I took this project to the 2009 Big Bang UK Young Scientists and Engineers Fair, then on to the 2009 EU Contest for Young Scientists, where I was awarded the EIROforum CERN Prize. Last summer I spent a week at CERN, the European particle physics laboratory in Geneva. How much I enjoyed it can be demonstrated by how eager I am now to take part in their summer student program. Through my experiences Ive been lucky enough to meet lots of different people, from fellow students to renowned scientists, and Ive also gained a lot in terms of confidence and motivation. Its incredibly invigorating to be in an environment like CERN where, for a change, enthusiasm for science is the norm. Through being made an Ignition* Creative Sparkone of 10 people ages 14 to 21 given grants for creative work in science, technology, engineering, or mathematics as part of a regional initiative Ive been given opportunities to look into science communication. I want to do my best to ensure that no one misses out on what physics can offer. Following from my trip to CERN and the work I did at Sheffield Im especially keen on publicizing the lesser-known particle physics experiments going on around the world. I believe that being relatively young and new to physics myself has helped me in explaining concepts and talking to young people; and while I doubt my own writing has yet convinced anyone of the wonder that lies in physics, I hope that one day it will. As a young person who almost dropped physics at school, I believe we need to do much more work if we want to inspire the next generation of potential physicists to carry the subject on beyond obligation. In the UK, a cultural shift is clearly needed; based on my experiences with students from elsewhere in the world, I think that one possibility is to introduce science fairs at school and county levels, and to hold winners of science competitions in the same regard as winners of sporting competitions. Subjects like particle physics and astrophysics can interest students in a way that the physics routinely taught in schools simply doesnt. Ensuring there are people who can competently communicate these ideas will hopefully help us inspire students to carry on with the subject and solve the big problems in the future. The national curriculum needs to take advantage of these concepts to prevent putting people off science for life. Perhaps with these efforts, the Large Hadron Collider could prove to be my generations Apollo program. 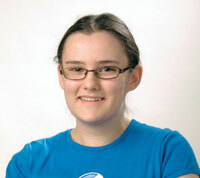 Courtney Williams is a theoretical physics student at Imperial College London. Her writing has appeared in IoP Interactions and E&T Education. Her website can be found at www.courtneywilliams.co.uk.